For many years we have had a large pile of Barbara's drawings in our basement. They have not been well treated, may have been water-stained or otherwise damaged They are not her best work: most of those having been given away or sold long ago. Most of these were done as quick sketches, often only one or two minutes, done at weekly sessions that Claudia Chapline and Harold Schwarm hosted in their Seadrift home and studio. The models were mostly young people from the area, friends of one or more of the artists. Nonetheless, these drawings show her graceful fluidity of line. The photographs were taken with a hand-held camera which made it difficult to avoid distortions.This one was already framed and the glare from the glass can be seen in the upper left. 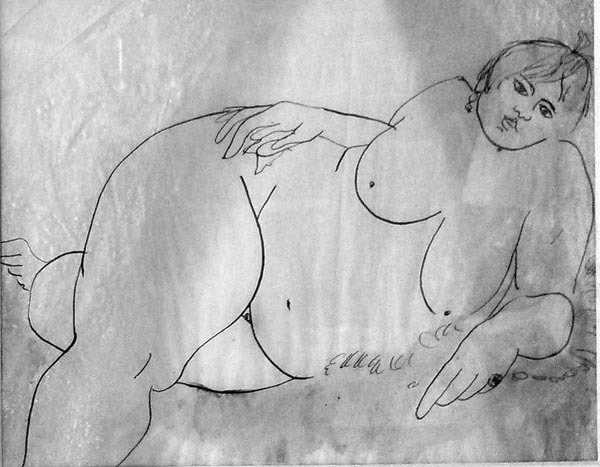 The very popular model was affectionately called "Fat Kate" by San Francisco artists. She died at a very young age in a bizarre accident on Douglas Street near Castro: a roofer's tar pot broke free, rolled down the steep hill and crashed into her car. The drawing is water damaged. If you knew the model, you would be surprised by the quality of the likeness.